Currency swing trading is aimed at catching reactions within the major trend (either bullish or bearish) and seeks to take advantage of trades that can last anywhere from a couple of days, to around a week in duration. 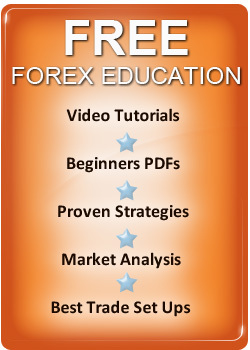 In this respect it is a short term form of trading and is the only short term FOREX trading method that works. FOREX day trading is attempted by many FOREX traders but simply doesn’t work, because the data is not valid and volatility can and does take prices anywhere in a day. Support and resistance is therefore not valid and day traders lose. Swing traders are trading short term - but support and resistance are valid and make these moves tradable. Currency swing trading is normally carried out between support and resistance levels within the major trend. The FOREX trader will watch prices move into support or resistance and then take the opposite view and execute a trading signal in the opposite direction. As with any currency trading system, it is important not to simply take a position and hope that support and resistance levels hold – the trader should look confirmation. This means a waning and turn of price momentum, to confirm that support and resistance are likely to hold and then execute a trading signal. By acting on confirmation in this way with a FOREX swing trading system, the trader is keeping the odds on their side and this is essential in any FOREX trading strategy, to win longer term. Stop levels are then placed behind the support or resistance level. Unlike FOREX trend following where a trader will place and trail a stop, a currency swing trader will operate using a target. The target will normally be just above support and resistance, that lies in the direction they are trading in and when prices approach the level, the trading profit is banked. Euro, Yen, British Pound, Swiss Franc, Canadian and Australian Dollar. The euro and the yen are the two best currencies to focus on, as they offer great volatility and large volumes, which means FOREX brokers, offer tight spreads. Any currency that does not have good liquidity, should not be swing traded. Liquidity is essential, for locking in profits quickly and just as importantly, limiting losses. In currency swing trading the cost of doing business adds up, as you are trading frequently and aiming for smaller profits, than you are in long term trend following. It is therefore essential to pick a broker that will offer you tight spreads (around 3 pips) to prevent the cost of doing business impacting on your profit. Currency swing trading is very easy to learn. All you need to use is support and resistance, a few momentum indicators and your all set. Resist the temptation to make your currency trading strategy to complicated, cram in to many indicators into your FOREX trading system and you will have too many elements to break and it will fail. Swing trading systems should be kept simple, as simple systems tend to be more robust in the face of brutal market conditions than complicated ones. All the best swing traders use simple systems and you should to. If you keep your currency swing trading simple, you will understand the logic of it and it will be robust which, will mean that you will be able to apply it with discipline. This is essential for currency trading success. It should only take you a few days to learn a swing trading method and then you can look for profits in under an hour a day. You don’t need to spend all day following the price action. A good time to look for currency swing trading set ups, are at the end of the US trading day, when the NYSE closes. Swing trading is ideal for novice traders and you can read why in our section swing trading for beginners for an idea of how to construct and apply a swing trading system for profits, we have given the basics of the way we do it in the section Swing trading in FOREX. Currency swing trading is a great way to build significant profits over time and is ideal for novice traders, as well as experienced pros.